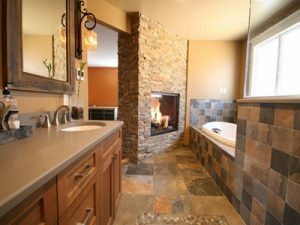 There are many types of tile that you can incorporate into your bathroom remodel. Choosing the right one is important in order to remain consistent with the theme you are trying to capture. It must be functional, economic, and aesthetically pleasing. There are pros and cons to each bathroom tile type, so how do you know which one is right for you? Here are some of the options and pros and cons to each. Marble can often create a great contrast with the colors you choose for your walls. It portrays a feeling of grandeur and is incredibly unique. However, it is also a high maintenance stone. Marble requires regular sealing and cleaning. Ceramic bathroom tile is generally a good choice. Its crisp look is very popular, and it has added benefits of being easy to clean, durable, and fairly inexpensive. Porcelain tile, another good choice, is a type of ceramic tile. As it is in the same family, porcelain bathroom tile is extremely durable. It also comes in a variety of colors and textures, which makes it easy to match the style and theme of your space. Glass tile is a great option for adding color and style to your bathroom. You can use multicolored glass tiles in a backsplash, or for interest on the walls and around the tub. It leaves a clean and tranquil impression on your space. However, glass bathroom tile is also generally one of the more expensive choices. For more information or inspiration, browse our galleries, contact us to schedule a free, easy consultation, or come visit our kitchen and bath showroom!